When receiving an email campaign (like when you receive a simple email), there are two main information that appear in the recipient’s inbox: the subject line and the from line (sender). The From line or Alias is the name that appears in your recipient’s inbox, as the sender of the message. 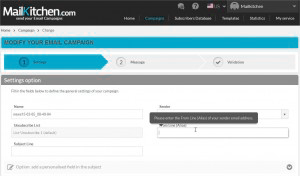 When sending an email campaign you can define the text that you wish to appear in the From Line. When creating your email campaign, you can define the text to appear in the from line of your emails. You can insert, for example, the name of your website, the name of your company or your service – whatever name that can be easily recognized by your recipients and that can encourage them to open your email message. To be sure that your From line is displayed correctly in the inbox of your recipients, choose an alias that does not exceed 21 characters. The number of characters displayed in the From line varies depending on the email provider, but as a general rule, for the main webmails (Gmail, Yahoo, Hotmail, etc) the from line is is never less than 21 characters long. Using upper cases in From Line as well as in the subject line of your email can be detected as Spam by anti-spam filters. You should therefore avoid it. Don’t use too generic names in the Alias - the recipients need to be able to identify the true sender of the emails. Use the name of your brand, your company or your website. Your newsletters will have an higher chance to be opened if the recipient recognizes your brand or company name.